BittWare A10PED – 2x Intel Arria 10 GX FPGAs, 2x PCIe x8, 4x 10GigE, QSFP :: Zerif Technologies Ltd.
BittWare’s A10PED is a full-length PCIe x8 card featuring two Intel Arria 10 GX FPGAs. The Arria 10 boasts high densities and a power-efficient FPGA fabric married with a rich feature set including high-speed transceivers up to 15 Gbps, hard floating-point DSP blocks, and embedded Gen3 PCIe x8. The board offers flexible memory configurations, supporting a Hybrid Memory Cube along with up to 32 GBytes of memory. Two 12x Avago fiber optic modules and a QSFP cage provide high-speed, low-latency I/O direct to the FPGAs. The A10PED also incorporates a Board Management Controller (BMC) for advanced system monitoring, which greatly simplifies platform management.All of these features combine to make the A10P3S ideal for a wide range of applications, including network processing, cyber security, compute and storage, instrumentation, broadcast, and Signals Intelligence. Built on 20 nm process technology, the Arria 10 FPGAs feature industry-leading programmable logic that integrates a rich feature set of embedded peripherals, embedded high-speed transceivers, hard memory controllers, and protocol IP controllers. Variable-precision digital signal processing (DSP) blocks integrated with hardened floating point (IEEE 754-compliant) enable the Arria 10 to deliver floating-point performance of up to 1.5 TFLOPS. The FPGA supports Gen3 PCIe x8 via a hard IP block and provides up to 1150K equivalent LEs. Development tools for OpenCL include Altera’s SDK for OpenCL and BittWare’s OpenCL Developer’s Bundle. The A10PED provides a variety of interfaces for high-speed serial I/O as well as debug support. Two 12x Avago fiber optic modules are on the front panel, supporting high-density, high-speed optical interconnects. A QSFP cage is also available on the front panel, supporting four 10GigE channels. The Avago and QSFP SerDes channels are connected directly to the Arria 10 FPGAs, thus removing the latency of external PHYs. The QSFP cage can optionally be adapted for SFP+. Several additional interfaces also support high-speed I/O. Two Gen3 x8 PCIe interfaces connect to the FPGAs via 16 SerDes lanes, allowing for a x8 PCIe connection (to FPGA A) in a standard slot or two x8 interfaces (one to each FPGA)in a bifurcated slot. Two SerDes lanes are available via SATA connectors to connect external storage devices or provide direct board-to-board communication. A USB 2.0 interface provides debug and programming support. The USB features a built-in Intel USB-Blaster and is connected to the Board Management Controller. The board also provides an on-board powered GPIO header. The A10PED features four SODIMM sites, each supporting up to 8 GBytes of DDR4 with optional error-correcting codes (ECC). A Hybrid Memory Cube (HMC) provides high-performance serial memory. Additional on-board memory includes flash with factory default and support for multiple FPGA images. Hardware accelerator diagram: BittWare A10PED with two 12x Avago fiber optic modules, connected to the FPGAs via 12 SerDes channels each. 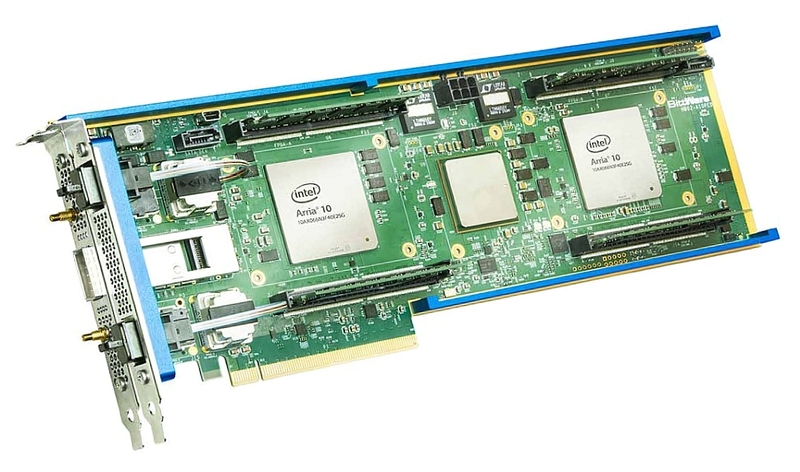 A10PED is a full-length, standard-height, double-wide PCIe x8 card featuring 2x Intel Arria 10 GX FPGA cards.